The Medieval Women’s Choir is a Resident Ensemble at St. James Cathedral, located at Ninth and Marion in Seattle’s First Hill neighborhood overlooking downtown Seattle. To reach the Cathedral take the James Street Exit from I-5 and head East (up the hill) on James Street and then take a left on 9th Avenue. The Cathedral is located two blocks north on the right-hand side. 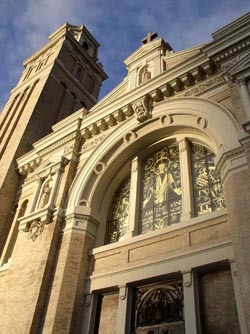 Wheelchair access is available in the Northeast (Marion St.) and Southern (Columbia St.) vestibules of the Cathedral. Formerly Bethany Lutheran Church, the 7400 Woodlawn serves as home base for the Medieval Women’s Choir. We attend our weekly rehearsals here, and are happy to make use of the beautiful sanctuary from time to time for concerts and events. The building is located two blocks northeast of Green Lake Dr. N between Latona and 2nd Ave. NE in the Green Lake neighborhood. There is handicapped parking available in the parking lot behind the main building, with street parking available throughout the neighborhood. The sanctuary is accessed from the Latona entrance. 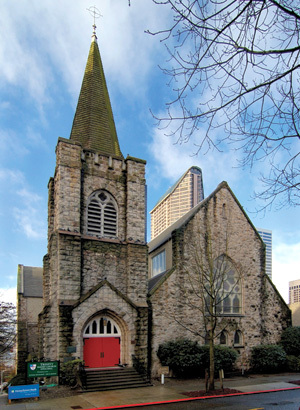 The Medieval Women’s Choir is performing in March in Trinity Parish Church’s Great Hall, located at Eighth and James in Seattle’s First Hill neighborhood overlooking downtown Seattle. To reach Trinity take the James Street Exit from I-5 and head East (up the hill) on James Street, taking a left on 8th Avenue. 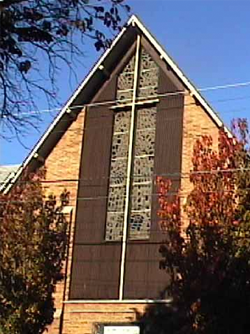 The church is located on Southwest corner of James Street and 8th Avenue. Parking for concerts at Trinity is located in the parking garage at Skyline at First Hill. The entrance to the garage is located on Columbia Street between 8th and 9th Avenues. 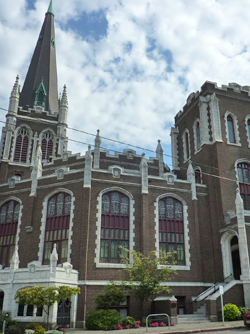 The newest venue for the Medieval Women’s Choir’s winter concert, historic Seattle First Baptist Church is located in the heart of Capitol Hill with convenient parking adjacent to the church. Accessible entrance located on Harvard Avenue. The church is served by Seattle Streetcar, and Seattle Metro stops directly in front of the church (Route #2). From Broadway, turn west on Union and then southeast on Harvard Ave. The spire of the church is visible from Broadway. 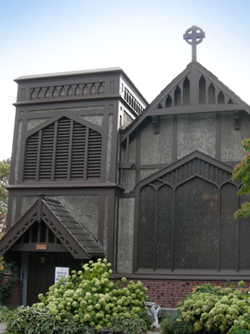 Our new home for the Spring Frolic, this tudor-style church is nestled into the Magnolia neighborhood with on-street parking and a small lot located across from the church. I-5 North to the James St. exit. Turn right on James (heading east); James becomes Cherry at the top of the hill. Turn left on 34th, and continue on 34th as it curves to the right and becomes East Denny. The church is on the right, on Denny, between 37th and 38th Avenues. I-5 South to the Bellevue/520 exit. Go through the tunnel and exit at Montlake (first exit). Turn right and continue south on Montlake, which becomes 24th Avenue, and then becomes 23rd Avenue East. Turn left at East Union. Continue east to 34th Avenue. Turn left on 34th and continue on 34th as it curves to the right and becomes East Denny.